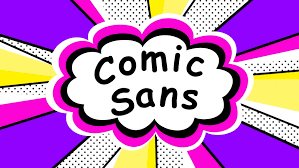 When Vincent Connare invented the typeface Comic Sans in 1994, he never set out to offend anybody. The typographer designed it for some of the first Microsoft home computers: it was intended for the speech bubbles of an animated cartoon dog that would help people navigate the Microsoft Windows interface for the first time. “I said, ‘Comic dogs don’t talk in Times New Roman,'” Connare recalled. So, he developed an alternative; a playful, friendly font inspired by comic book type, designed to look handwritten and targeted at younger users. “My original idea was it was going to be used for kids. It wasn’t made for everybody to like it,” Connare told Live Science. This entry was posted in Tools and Information and tagged Comic Sans, Microsoft Windows, Times New Roman. Bookmark the permalink.